Is it a joke? No! It’s a U.N. reality show : On 29 April 2003 the United Nations Economic and Social Committee admitted Cuba onto the U.N. Humans Rights Commission – for a period of three years. To its own detriment: Is the U.N. turning itself into a self-service organization for dictators and reactionary diehards? That decision came only weeks after Fidel Castro had ordered the sentencing of 75 dissidents to long terms in prison, including the renowned journalist Raul Rivero, and the summary execution of three hijackers of a Cuban ferry – in spite of the Pope’s appeal for clemency. Cuba should follow Estonia’s example and liberate itself from the chains of the old dictator with the help of the European Union. Bye, bye, Fidel ! 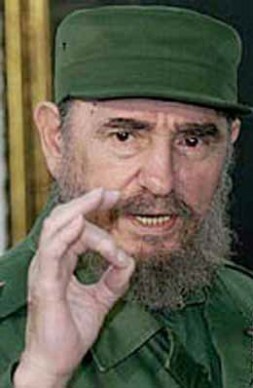 Castro, it's time to say "Goodbye!" The Cubans should set up a free counter-Parliament on neutral territory – modeled on the Eesti Comitee established by independence activist Tunne Kelam in Estonia (see www.kelam.ee; "ESTONIA: Alice in Foreign Affairs Wonderland") – to discuss and decide the future of the sugar-cane island, albeit without any governmental power for the time being. The so-called "VARELA project" is a worthwhile movement along these lines that needs the full backing of the E.U. right now in particular. Under no circumstances in Miami, but on neutral soil: ideally Europe, in Prague under the auspices of the Czech liberationist hero Vaclav Havel, who only a few days ago put out an appeal for support for Cuban democrats (see "Cuba: Time for Action") together with Lech Walesa and Árpád Göncz, the ex-Presidents of Poland and Hungary, respectively. The EU and the European Council ought to stand as sponsor at this crucial baptism of Cuban freedom. This is a job for public figures of known integrity and advocates of integration in the cultural sphere and the Church; they should be young people, for this is about their future. Cuban exiles from the U.S. should participate, but shouldn’t push their way to the front. The “Free Cuban Parliament-in-Exile” should draft a "Cuban Democratic Constitution" and put it to a referendum in Cuba with the help of the E.U. The referendum needs to be tied to a lifting of the Cuban embargo. Havel, Walesa and Göncz are right in demanding that “European countries should establish a ‘Cuban Democracy Fund’ to support the emergence of a civil society in Cuba and ought to make it clear that Castro is a dictator.” Then Castro’s rhetoric would fall on deaf ears. He could no longer label regime critics “mercenaries of the U.S. government”. It is up to Europe to take action now, above all France and Germany. For decades, particularly with their socialist governments, both countries have had very close contacts with Cuba and a great deal of influence on Castro personally. France and Germany could try to do a better job than the United States of showing how to spread democracy in the world without the use of force.